Creates a vertex for lod. The surface class convertes a tile::accessor to an iso-surface. Call this class by one thread at a time. Uses marching cubes and transvoxel for surface-generation. http://www.terathon.com/voxels/ To understand this class and algos please read Eric Lengyel’s Dissertation: http://www.terathon.com/lengyel/Lengyel-VoxelTerrain.pdf . If you got a custom voxel, that effects the resulting surface derive this class and reimplement vertexGotCreated() and vertexGotCreatedLod(). Private methods are undocumentated because they simply implement the code described in Eric Lengyel’s Dissertation. calculateSurface calculates the iso surface. 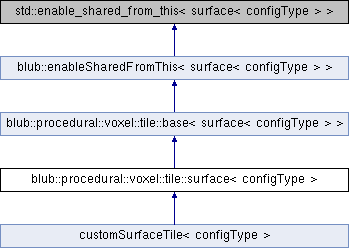 voxel Contains the voxel needed for the surface calculation. calculateNormalCorrection check chapter 3.3 in Eric Lengyel’s Dissertation. lod Lod index starting with 0.
does the transvoxel algo get applied. getPositions returns resulting transvoxel-list. Vertices for these indices are in getPositions() and getNormals().